Nearly 4 in 5 Asian-American millennials disapprove of how President Donald Trump is handling his job and also believe the country is headed down the wrong track, according to results from an NBC News/GenForward Survey released Wednesday. The survey also revealed that a majority of Asian-American millennials (69 percent) disapproved of the job Congress is doing and that just as many have a favorable view of the Democratic Party as they do an unfavorable view of the GOP (both 68 percent). The NBC News/GenForward Survey was conducted Aug. 31-Sept. 16 among a nationally representative sample of 1,816 adults aged 18-34, of which 258 identified as Asian American. Interviews were conducted in English and Spanish. This window into the views of Asian-American millennials comes a little more than eight months into Trump’s presidency as a host of hot-button issues like health care, immigration, and race relations consumes much of the daily national discourse. The survey found about the same percentage of Asian-American (78 percent), African-American (79 percent), and Latino (77 percent) millennials disapprove of the way Trump is handling his job. A majority in each of those three racial groups also believe the country is headed in the wrong direction — with 79 percent of Asian-American millennials responding that way. An overwhelming 88 percent of Asian-American millennials said they believe the country is more divided since Trump took office. Around 2 in 5 Asian-American millennials plan to vote neither for the Democratic or Republican candidate in the 2018 congressional elections or said they were not sure. Democrats and Republicans, as well as community nonprofits, have worked to push more Asian Americans and Pacific Islanders (AAPIs) — a bloc that roughly accounts for 5 percent of voters nationwide and has historically seen low voter turnout — to head to the polls. 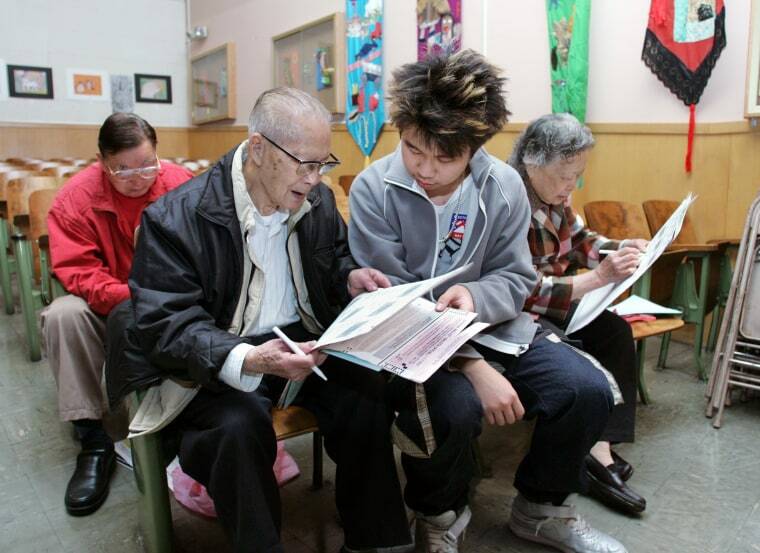 Those efforts, particularly with younger AAPIs, may be yielding results, census data show. The percentage of registered voters between ages 18 and 24 who said they were of Asian descent increased from around 44.5 percent in 2012 to 48.9 percent in 2016, while those who voted rose from 33.1 percent to 40.1 percent, according to the Census. The figures showed a fractional decrease in Asian registered voters in the 25-to-44 age bracket and a slight uptick in those who voted. By contrast, around 70 percent of the total population was registered to vote and 61 percent reported voting last year, according to the Census. Still, the NBC News/GenForward Survey found that nearly 1 in 3 Asian-American millennials did not cast ballots in the 2016 election. Around half said they voted for Democratic nominee Hillary Clinton, 13 percent Trump, and 5 percent someone else. When it comes to party identification, close to half of young Asian Americans chose Democrat, 9 percent Republican, and 3 percent skipped or refused the question. But more than 2 in 5 said they consider themselves independents or something else, the NBC News/GenForward Survey found. “But that was actually a trend we saw with Asian Americans for several decades, where Asian Americans were the main group that was showing neither party speaks for us, we’re not checking either box,” Wang added. While the Democratic Party does do favorably among a majority of young Asian Americans (68 percent), roughly 1 in 5 hold the opposite view, the survey said. Around 30 percent also believe the Democratic Party doesn’t care about them. Naomi Ko, a 27-year-old Korean American from Minnesota and a registered Democrat, said the party can do more. Young Asian Americans identified health care, racism, and education as the three most important problems facing the country today, according to the NBC News/GenForward Survey. As the fight in Congress to repeal and replace the Affordable Care Act wages on, access to health care remains a top priority for Asian-American millennials like Ko. “If we aren’t healthy are we’re stressing out constantly about being sick or not being able to go to the doctor, that just takes so much time, so much money, and so much space in our lives,” Ko, a television writer, said. But despite believing the U.S. is headed down the wrong path, a majority of Asian-American millennials (64 percent) still remain optimistic about their personal future. It’s a feeling also shared by Ko, the child of immigrants. “What’s the point of being in America and trying to pursue a better life if we don’t make it better and also if we don’t think it will get better,” she said. The NBC News/GenForward at the University of Chicago Survey was conducted Aug. 31-Sept. 16, 2017, among a nationally representative sample of 1,816 adults ages 18-34, recruited and administered by NORC at the University of Chicago. The overall margin of sampling error is +/- 3.8 percentage points. The margin of sampling error for Asian Americans is + / - 8.81 percentage points. For full results and methodology, click here.